Thank you for your interest in becoming a firefighter. The work of a firefighter is challenging, exhausting and rewarding all at the same time. Pursuing a career in fire protection services is noble and commendable, but is certainly not to be taken lightly. GPSTC’s Basic Firefighter Training Program is an intense eight-week course that will test candidates, both mentally and physically. After completing GPSTC’s Basic Firefighter Training Program, students will sit for the GFSTC written NPQ Firefighter I test, which, upon passing, earns students state certification as a firefighter. Students will also have the option of taking an additional skills test to earn National Firefighter I certification. 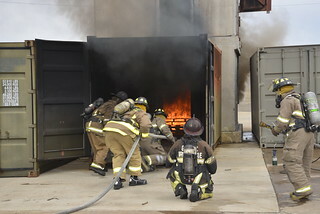 Georgia’s firefighter certification process is regulated by the Georgia Fire Standards and Training Council (GFSTC). Candidates interested in pursuing a career as a certified firefighter may enroll in the Georgia Public Safety Training Center’s (GPSTC) Basic Firefighter Training Course prior to making application with GFSTC if they meet the following minimum requirements: are at least 18 years old, have completed a medical release affidavit, have completed CPR certification, and have completed NIMS level 100 and 700 training, available on the Federal Emergency Management Agency’s (FEMA) website. Contact the Georgia Fire Academy. For resources on becoming a firefighter in other states, please visit the How to Become a Firefighter national website.